RAM is an important component because the PC uses it for the temporary storage of data and code that it needs to perform a task like recoloring an image, rendering a movie, multitasking between programs, and printing a picture. It's fast, and the PC can access it much more quickly than data from the hard drive. When RAM gets full though, and there's no free space left for storing data temporarily, the PC sends data over to the hard drive in an area called a paging file. Accessing data from the paging file takes much longer than accessing it from RAM, so if you are low on RAM, you're sure to experience slower response times than you need to. 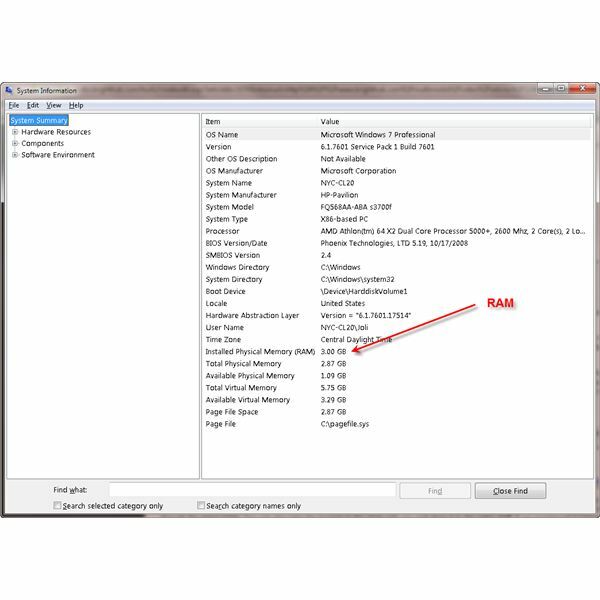 You can find out how much random access memory is already installed from your computer's properties page. So, just how hard is it to purchase and install extra RAM? It isn't difficult at all! These days, you simply figure out what kind of RAM you have, walk into a computer store, and purchase it right off the rack. It used to be much more complicated than this, and you'd have to order directly from the manufacturer, or worse, take your PC to a shop. The first step involved in adding more RAM is to take a few minutes and determine how much RAM your PC already has. 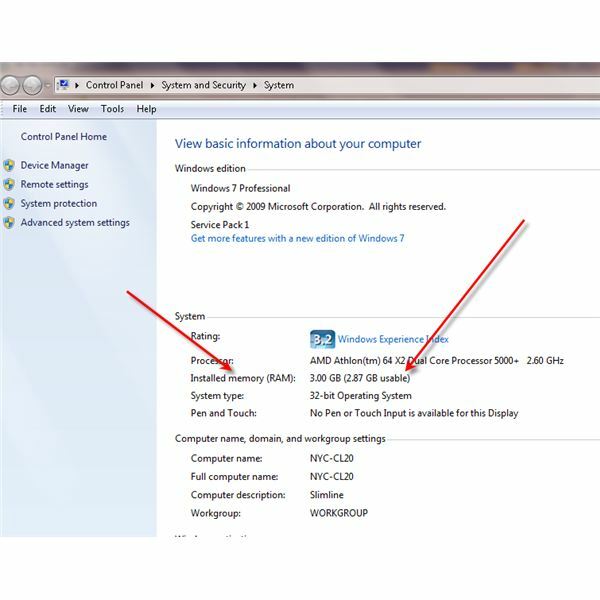 You can do this in a number of different ways, including viewing the My Computer's Properties page in XP, the Computer properties page in Windows Vista, or from the System window in Windows 7, shown in the previous section. You can also find out from System Information using any Windows-based OS. Just click Start, click Run, and in the Run dialog box type msinfo32.exe. (In Vista type msinfo32 in the Start Search window.) Click OK. Once you know how much RAM you have, you can decide if more would be better. In most cases, the answer is yes. There are many types of memory though, so you'll have to make sure you get the right kind. There are lots of kinds of computer memory: SIMMs, DIMMs, PC133, PC2100DDR, PC100, and more. You can't just go out and buy a memory stick; you have to know what kind you need. If you have the information booklet that came with your PC, you can find out what kind of memory you should get by glancing through the specs page. You can also take the booklet to the store with you and show it to the sales staff. If you purchased a computer from a major manufacturer like Gateway, Hewlett-Packard, Dell, IBM, or Compaq (just to name a few), and you can't find your information booklet, simply call tech support or visit the company’s Web site. You’ll find the information there. Once you have the RAM in hand, you'll need to install it. Your RAM should come with installation instructions, but for the most part installing RAM is as simple as turning off your computer, unplugging it, locating the slot on the motherboard, and popping in the RAM. Some pop straight in, and some slide in from an angle. Be careful when you install it though, you don't want to shock the board or the RAM. Make sure you touch the chassis and have unplugged the computer before performing any installations. Read the instructions carefully because different memory types install in different ways, however, installing RAM is generally quite simple. Once the RAM is installed, you can watch the boot up process (if your computer doesn't have a splash screen that hides it). Here you’ll see the RAM being counted prior to the computer starting. You can also view the new RAM information from the My Computer's Properties page or from System Information. You want to make sure your new RAM has been detected properly. If it hasn't, try installing it again, or contact the manufacturer from where the memory was obtained for technical support. The author took these screen shots from her Windows 7 computer. It's the author's experience that adding memory is truly the best way to quickly beef up a sluggish media computer. However, it's imperative that during installation you are sure not to cause any damage to sensitive internal parts. That said, you should always wear an anti-static wrist strap, research the memory before purchasing it to make sure it's the right brand and type for your computer, and ask for help if you think you need it. 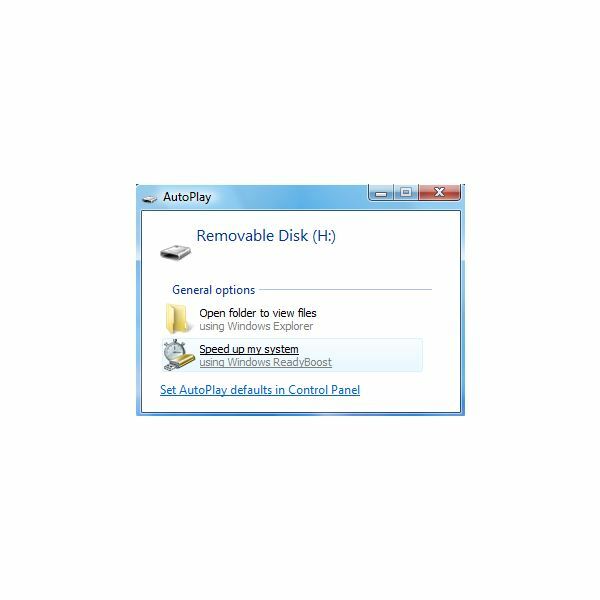 As a side note, Windows Vista and Windows 7 support ReadyBoost, a technology that enables you to use external flash drives and memory cards as RAM, provided they meet minimum requirements. When you insert a card, you'll be prompted to use it, and it will be checked for compatibility. This is often a good way to improve the performance of a computer that cannot accept any more physical RAM.